[toc]Vertigo is a sensation where one can feel spinning, moving and whirling of the entire environment around them. This is a common condition where the problem lies in the posterior semicircular canals of the ear, medically called the vestibular labyrinth portion of the ear. Since one feels dizziness, it is common that the occurrence of such a condition leads to nausea and loss of balance. The causes of such a condition can be traced back to medical problems in one’s body like cardiac problems, thyroid disease, diabetes and cholesterol problems. On the other hand reasons like acute head injury, motion sickness, ear infections and vision problems can also cause vertigo. As the problem has one or more reasons, there is more than one solution to it. Unless caused suddenly or due to some serious injury or surgery, vertigo can be treated naturally and without the use of too many medicines. Besides, there are various precautions that itself are a cure to vertigo attacks. Visiting a doctor is recommended only if the problem is severe and recurs often. 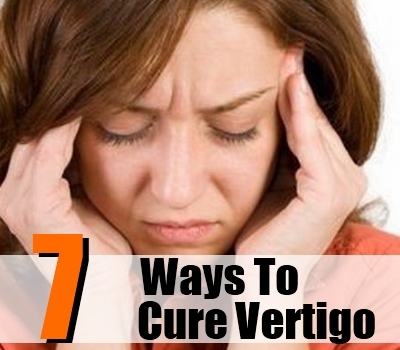 Here are a few things you can do to cure vertigo. If spinning of head is felt in the middle of a task or work, it is essential to close the eyes and sit at a place to avoid injuring yourself or falling down. What you can do next is lie down and push a couple of pillows below the head, the idea being to raise your head above the rest of the body to normalize blood flow. Once the sensation subsides, try maintaining focus on the still objects around you till the sensation wears off completely. For many, deep breathing helps make the brain realize that nothing around you is moving. Improper blood flow is a common cause for vertigo. Mild exercises that do not involve jerky movements or heavy lifting are advisable. 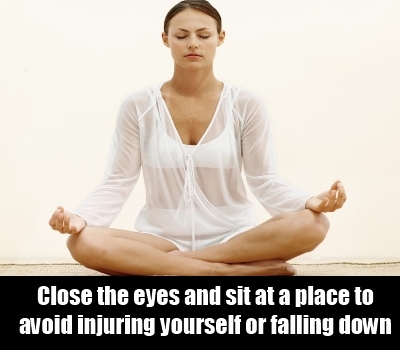 Yoga, deep breathing, meditation also improve blood flow and prevent vertigo attacks. Make sure that you do not stress a lot during physical workout. The idea is to relax and not exhaust oneself. Many may often feel dizziness post initial days of exercises, for them consumption of small portion of juice or a light on stomach energy drink is suggested. Healthy and balanced diet is one that contains less of sodium, sugar and cholesterol content but is high on essential nutrients, vitamin, proteins and other foods that provide energy. 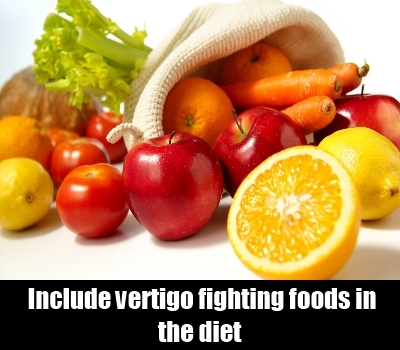 Include vertigo fighting foods in the diet. Fruits, juices, green and leafy vegetables, salad should be included in the daily diet plan. 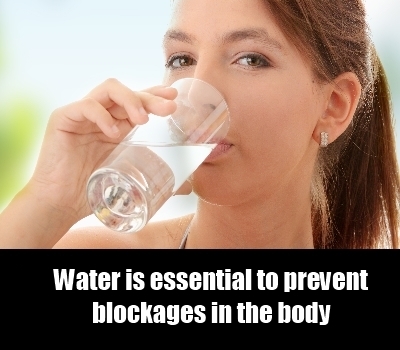 Water is essential to prevent blockages in the body and is a natural cleansing method required to cure most of the problems in the body. Another home recipe that you can try is, soak spoonful coriander seeds in a glass of water overnight and drink the strained water early in the morning. You can also mix with it some salt and lemon to improve taste and give the body the energy to prevent vertigo attack. Hydrating the system also helps improve blood flow in the body and regularize the internal system that can cause the spinning sensation. 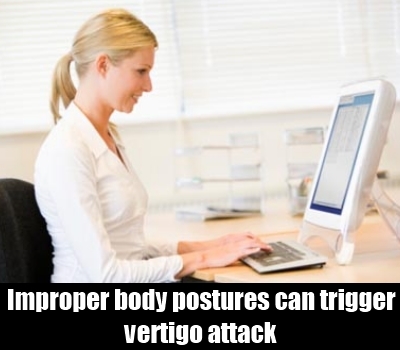 Improper body postures can trigger vertigo attack. At any given time, avoid bending the neck below the shoulder level, and if this cannot be avoided try not to keep the head below the level for long and continuous duration. For instance, instead of bending from the waist to pick up a fallen object, try bending the knees maintaining the shoulder and head straight. Also, avoid playing virtual and 3D games that play with the vision and affect the sensation at the ear causing dizziness. Joy rides at amusement park that involve a lot of jerky movement and erratic motion should be avoided. Try not to extent or bend the neck during sleep or an activity. It is also important to note that once the sensation subsides, get back to regular activity at the slower pace. Do not rush as and when you start feeling better. 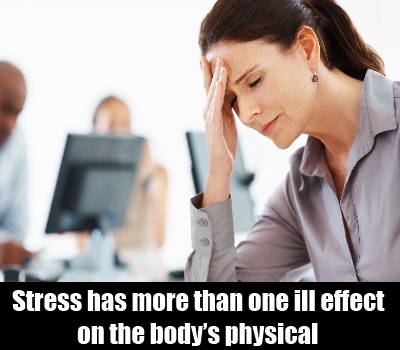 Stress is an unavoidable condition that is found everywhere in everybody’s life. It has more than one ill effect on the body’s physical and mental condition and therefore proper time and energy management is essential to prevent stress. A good sleep is a cure for vertigo. Many people give more time to their life and career and thus are left with no time for them. It is essential to know that sleep is meant to relax the body and gives the body the time it needs to repair and heal the tiredness it feels throughout the day. Sleep for at least 8 hours during night to give the body its essential time. Chiropractic Therapy is suggested for those affected by neck trauma. It helps align the vertebrae at the neck and reduce vertigo attack. Another is a Physical Therapy or Physiotherapy where one can learn techniques involving alternate signals from the eyes, limbs, neck etc. to maintain the body balance during a vertigo attack. Medication is also an option for those who feel extreme and prolonged vertigo sensation. Continuous use of anti vertigo medicines in small doses helps subside and gradually cure vertigo. 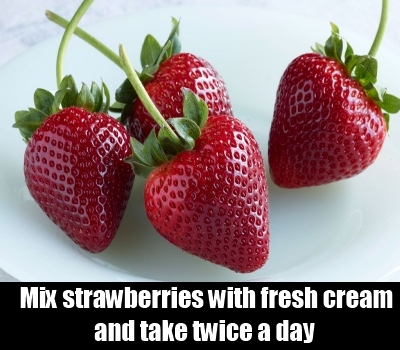 With all the diet and lifestyle changes, try a few of the following home remedies to cure vertigo: Try mixing ripe strawberries with fresh cream and take twice a day. Start you day with a glass of warm water, salt and sugar to keep the mind and body fresh and active. Add ginger to the diet. Chewing a small piece of raw ginger also helps. Soak almonds, poppy seeds (khus-khus), watermelon seeds and wheat grain overnight. Make a paste in the morning and fry with ghee and drink with milk for energy that lasts throughout the day. With all this, it is essential to know that different people have different reasons and symptoms that get cured differently. It is not essential that what worked for you shall work for everyone.